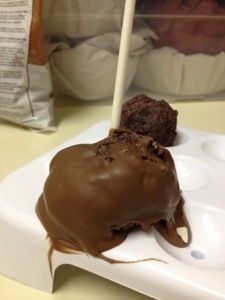 I was so pleased to get a cake pop maker for the holidays! I am obsessed with all things mini and bite-sized and since going on my “party-planning but never actually throwing a party” streak, I have become enamored with these dessert table staples. Interestingly enough, I happened to have half of a chocolate cake baked and sitting in my fridge (from a half batch of cupcakes I’d baked last month – the cake was still good!) 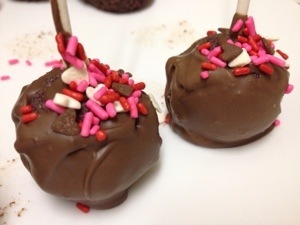 so before I tried out my new fancy cake pop making machine I decided to make one batch of cake pops the “original” way, a la Bakerella. I can’t remember exactly where I got the recipe but the basic premise is that you mix a baked cake with icing and cover it in melted chocolate. These things were addicting! In true imperfect form a few things went wrong. 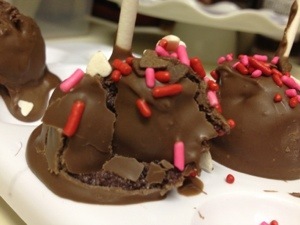 First, I thought I was being super genius by using the provided “drip trays” from my gifted cake pop maker… Turns out that is actually a cooling rack for un-covered cake pops so all the chocolate stuck and broke the pops when I tried to pick them up. Next, I have little to no understanding of proportion so the first pop was huuuuuge and basically fell off the stick at the first chance it got. Regardless of looks, these things tasted incredible despite my best efforts to mess them up. I’m excited to make some in my machine to compare! the hideous mess. too much chocolate or no? I’ll get the hang of this. Until then just close your eyes and bon appetit! ← are we ready to laugh about it? Making them without all the gadgets is definitely easier! Just crumble, mix and dip! Getting the hang of the consistency of the melted chocolate was a tough one but adding shortening to the chocolate helps. Good luck!